Double C Guides and Outfitters - A premium hunting guide on Utah's Wasatch, Book Cliffs, and Plateau Boulder units. 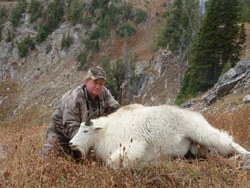 Double C Guides and Outfitters (formarly Wasatch-Uintah Guides and Outfitters) is a small yet personal guiding outift operating in some of Utah's top producing hunting areas. They have been hunting these areas for over 25 years on a personal level and professionally for nearly 10. Their small size insures that you get a high quality experience as they have only a couple hunters in camp at any one time. Horses are utilized to access the more remote elk and deer hunting areas as well as packing out the trophy once it is on the ground. These horses are a lifesaver on the mountain goat hunts as a hike up the mountain can end a hunt before it even starts for some hunters. Their goat camp is set at "Goat Level" and it is not uncommon to see goats from camp itself. 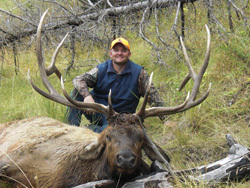 Double C Guides and Outfitters operates on all sub-units of the Wasatch Mountains and the Book Cliffs as well as the trophy elk unit of Plateau, Boulder/Kaiparowits. The roadless area of the Book Cliffs requires the use of horses to hunt effectively and Double C has the knowledge and experience to insure a successful hunt. They live within a short drive of the Wasatch Mountains unit and spend a lot of time watching the elk, mountain goats and moose. Their camp on the Plateau, Boulder is set in the middle of a roadless area that receives far less pressure than other, more accessable areas of the mountain. 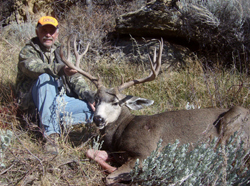 The Book Cliffs is a giant hunting area that offers great potential for trophy elk and deer. Double C knows this area well and will work hard to insure a successful hunt. Check out their website at Double C Guides and Outfitters or contact Hunters Trailhead for more details.